I read this article and found it very interesting, thought it might be something for you. 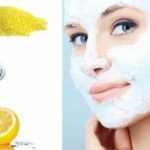 The article is called Facial Scrub For Oily Skin With Cornmeal, Yogurt And Lemon and is located at https://homemademasks.net/homemade-face-mask/lemon-juice-on-face/facial-scrub-with-cornmeal-yogurt-and-lemon-for-oily-skin/. An oily face can feel quite uncomfortable especially during the hot seasons. Although with the help of a facial scrub that is appropriate for your skin type, you will get closer to a fresh looking skin. Lemons are citric fruits and their medium level of acidity can help when dealing with an oily complexion. Lemon juice acts as a natural antiseptic and will also prevent blackheads. Yogurt is also very effective if used in a facial scrub or mask as it contains calcium, vitamin D and proteins. Yogurt can be a key ingredient and it helps with hydration while also fighting acne. Therefore the combination between yogurt and lemon is beneficial for balancing an oily type of complexion. This facial scrub with lemon will help exfoliate and absorb some of the oiliness leaving your skin feeling freshly clean and smooth. I love the face mask the scrubs.It beats going to a department store and spending tons of money on products that you really don’t know what they have in them .thank you.